The first teaser for Godzilla: King of the Monsters was already disappointing to a number of fans who were anxious to get another glimpse of the fearsome monster. However, the biggest disappointment of the teaser wasn't really what they chose not to show, but what they did choose to show. About 30 seconds into the teaser, there was a wide shot of Stranger Things actress Millie Bobby Brown that lasted for quite a few seconds. The shot showed the actress covering her ears as a response to the Godzilla screams over her radio. 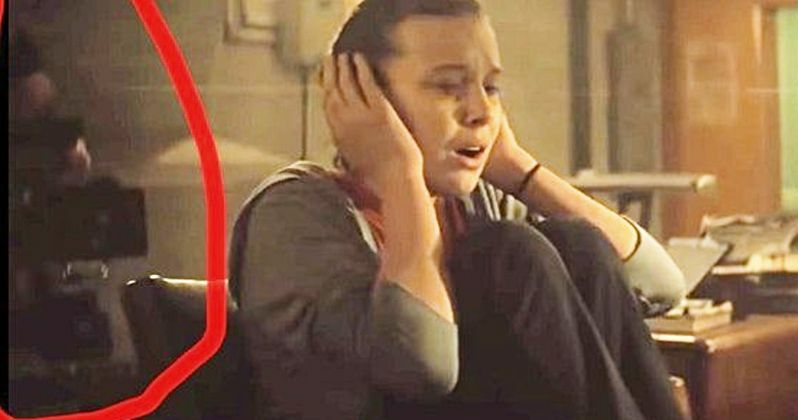 The biggest issue of this shot is that you can clearly see the camera operator pointing a camera directly behind Millie Bobby Brown. To make matters worse, as the shot goes on, the camera operator moves closer in on the actress, taking up a good portion of the space behind her. Whoops. Even if the camera operator himself isn't noticeable, the large camera with its square-shaped barn doors right behind the actress certainly is. Since the release of the teaser, a number of people online have pointed out this issue, starting to turn the Godzilla sequel into a bit of a laughing stock online. While Godzilla: King of the Monsters isn't necessarily the first big budget movie to accidentally include a crew member in the background, the fact that it included this huge mistake in the teaser of the movie is absolutely appalling. For movies like Godzilla: King of the Monsters, most of the money tends to come from the marketing of the movie rather than their "impressive storytelling abilities." Based on the fact that Warner Bros. managed to include this sloppy mistake in their first teaser, which was less than a minute long, things are not looking up for the movie itself. Though it may be easy to play the camera operator off as a "simple mistake," it's actually a lot more than that. This mistake is nothing more than lazy filmmaking. For this teaser to have been approved, it surely had gone through around a hundred different people, including the people who set up the shots to be included in the teaser, the marketing team that pieced it together, and the studio representatives who gave it the thumbs up. The fact that all of these people managed to miss a camera operator with a camera that is clearly visible on screen for a rather long lasting shot really shows how lazy the people involved actually are. If they can let a mistake as huge as this slide, what else are they going to let go down with this production? While the previous Godzilla from Warner Bros Pictures in 2014 was entertaining, it was far from a masterpiece and certainly made a few mistakes of its own. Based on the mistake seen in the latest teaser, Godzilla: King of the Monsters will likely be similar, with its blunders already clearly visible. You would think that a movie with a huge budget like the Godzilla movies wouldn't have these kinds of issues. We will figure out just how deep these mistakes go when Godzilla: King of the Monsters releases in theaters on May 31st, 2019. You can also watch the new teaser for yourself below. The camera operator appears at the 0:34 mark.